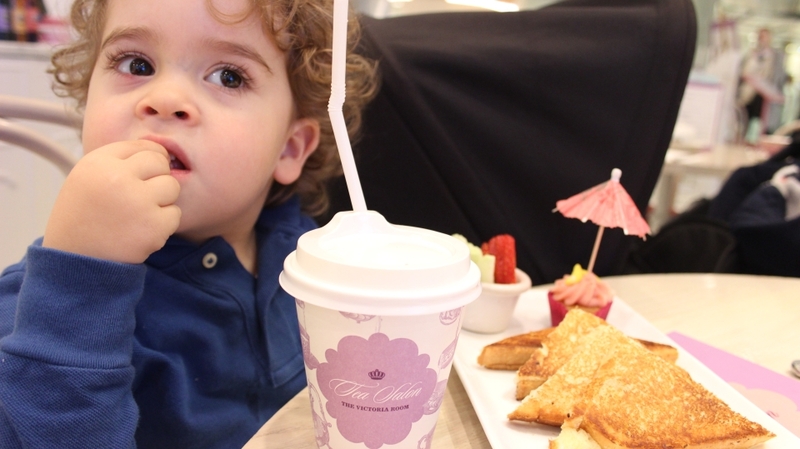 Prada, Gucci, Chanel…and one of the city’s most child friendly cafe’s! Amazingly, that’s precisely what The Tea Salon in Sydney’s Westfield is. Nestled amongst a dazzling array of designer fashion boutiques, I agree, it’s not the first place you’d think of taking your kids. However, my toddler and I have visited this cafe now on several occasions and it’s an absolute gem. Whether to enjoy a pre or post shopping spree refreshment, a light lunch or a leisurely afternoon tea treat, the Tea Salon’s menu is perfectly designed to satisfy little gourmands and their carers alike. The first time we visited this gorgeous cafe was immediately after we watched the Paddington Bear movie. I’d done my research and had found that this was possibly one of the only places in Sydney where you could enjoy one of Paddington’s favourites- the hilariously and evocatively named ‘Knickerbocker Glory’ sundae. When it arrived, the look on his face was priceless. This would have to be the ice cream of my son’s dreams, complete with wafers and cherry on top. Seeing part of the story brought to life before his eyes was very special. We’ve been back since for tea (the cafe has the most sublime tea and iced-tea menu) and long glasses of milk. Last week we went back to try out their children’s lunch after a morning at the State Library, run in the Botanic Gardens and a spot of shopping. The extremely reasonably priced meal consisted of a toasted cheese sandwich, bowl of fruit and a delicate little cupcake topped with the most perfect pink umbrella. My son was able to choose from a milkshake, peach nectar or iced tea ($11.95). If your child is a little more adventurous and wants to be just like mummy or daddy, they can also try the child friendly Anna Pavlova tea – a delicious mixture of citrus fruits, ginger, cinnamon, cloves and what the menu describes as ‘lashings of honey’. For the more mature palate there is a delicious lunch menu with a terrific range of dishes including vegetarian and gluten free options. The afternoon tea menu also contains a number of wonderful cakes for those with special dietary requirements. Needless to say, both my son and I left very satisfied! Although the fare supplied by this cafe is not entirely a nutritionist’s ideal, it is a magical, whimsical place that is perfect for a special treat. The gorgeous pastel décor is decadent, soothing and oh so pretty. So next time you’re in the city with your little one, make a point of popping in here. Bookings aren’t necessary but on the off chance you catch them at a busy time, they’ll take your number and give you a call when a table becomes available so that you’re not left waiting…and so that you can keep shopping!